After a strong January and February, the cannabis sector put out one of its worst weekly performances in 2019 last week. The broader equities market declined after weak jobs report; S&P 500 reported its first weekly drop since January. We think investors should properly reduce their risk exposure (e.g. cannabis stocks) as uncertainty remains high in the market. Cannabis stocks followed the broader equities market down last week. Horizons Marijuana Life Sciences Index ETF (OTC:HMLSF) lost 2.6% and ETFMG Alternative Harvest ETF (MJ) dropped 3.9% last week. Canadian Large-Cap: Against the backdrop of a turbulent week, the large-cap performances were influenced by Jefferies and Cowen initiating coverage on several stocks. Tilray (TLRY) dropped 12.0% after Jefferies initiated with an Underperform rating and a $61 target price. Aurora (ACB) gained 5.6% after Cowen called it a Top Pick with a C$14 target price. Cronos (CRON) was flat after it closed the C$2.4 billion investment from Altria. Aphria (APHA) was down 5.8% despite becoming fully-licensed at its entire Aphria One facility. Canopy (CGC) dropped 3.5% without major news. Canadian Mid-Cap: CannTrust (CTST) lost 11% while extending a rough ride since its NYSE listing. HEXO (HEXO), OrganiGram (OTCQX:OGRMF) and TGOD (OTCQX:TGODF) all fluctuated without major news. 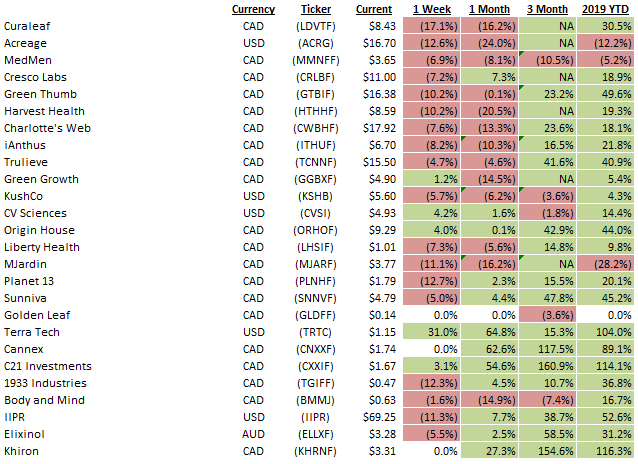 Canadian Small Cap: The small-caps exhibited higher volatilities. 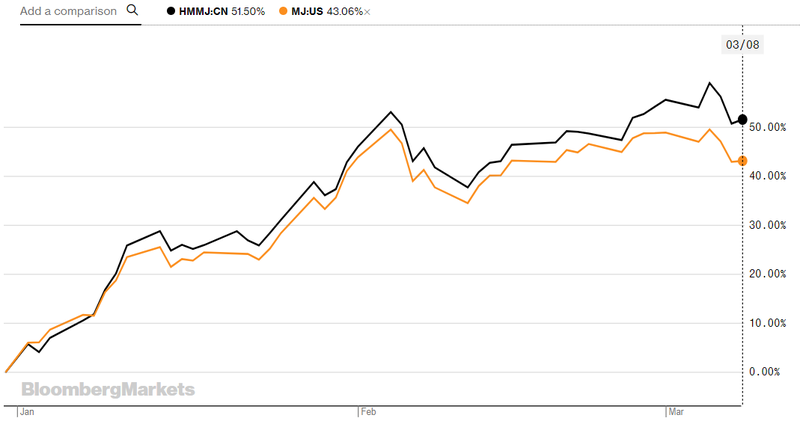 February's best-performing stocks MediPharm (OTCPK:MLCPF) lost 10.2% but Village Farms (VFF) managed to gain another 5.6% continuing its impressive run this year. One of February's worst-performing stocks, Namaste (OTCQB:NXTTF), lost another 25.5% after its auditor PwC and two Board members resigned last week. We've also added a few retail and extraction players to the watchlist: Westleaf, High Tide, Valens GroWorks, and Neptune. U.S. Multistate Operators: U.S. cannabis stocks suffered another bad week following the broader equities market. Most MSOs declined while Acreage (OTC:ACRZF) and Curaleaf (OTCPK:CURLF) were the biggest losers last week without major news. Terra Tech (otc:TRTC) was the biggest gainer with a 31% jump but the stock has been very volatile in the past. We've also added a couple of emerging players to the watchlist: Cannex and C21 Investments. Ancillary and International: CBD stocks were on the watch after FDA Commissioner Scott Gottlieb resigned leaving questions open regarding the regulation of CBD in food and drugs. Charlotte's Web (OTCQX:CWBHF) lost 7.6% but CV Sciences (otcqb:CVSI) managed to climb 4.2%. Supplier KushCo (OTCQB:KSHB) dropped another 5.7% erasing most of its gains in 2019. Innovative Industrial Properties REIT (IIPR) declined 11.3% but the stock remains over 50% higher this year. Khiron (OTCQB:KHRNF) was flat last week after the stock rose more than 115% in 2019 so far. Cannabis stocks suffered one of the worst weeks in 2019 after a monster rally to kick off the year. We think the decline last week was not driven by fundamental developments in the cannabis sector but rather the broader equities market. The S&P 500 just had its first down week since January as investors are grappling with weak jobs report and trade uncertainty with China. Cannabis stocks are risky assets and often times trade on momentum. We have seen in the past that volatility in the broader markets can have a significant impact on the cannabis sector as investors switch between risk-on and risk-off modes. 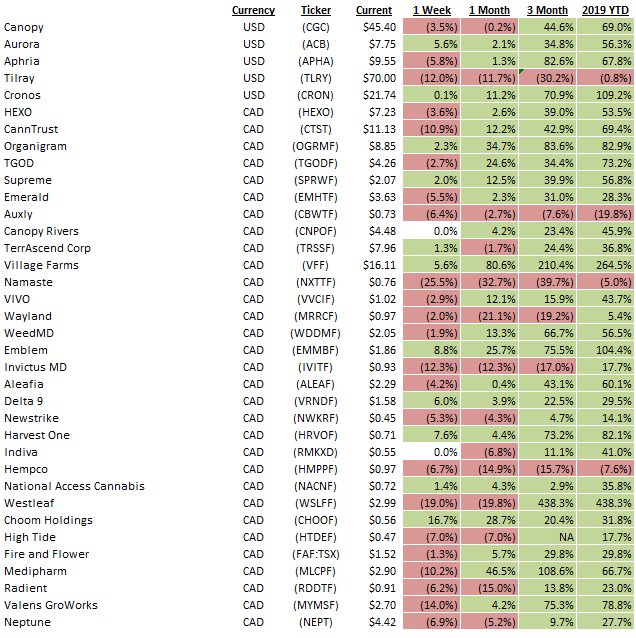 Overall, we think there is room for a correction as many cannabis stocks have gained a healthy amount since the year began which is largely a reversal of the sell-off during late 2018. Many investors are probably looking to take some profits off the table after the recent run especially when the broader market is exhibiting increasing anxiety in the past few days. We have seen some of the recent high-flyers tapering off all-time highs (Cronos, Canopy, Khiron, MediPharm) and some of the drivers that historically caused big rallies for certain stocks not working as well this time around (NYSE listing, licensing, initiating coverage). This is to be expected as the industry matures and more institutional money gets into the sector. We think investors should consider taking some profits off the table as uncertainty in the broader stock market remains high at this point. The economy is showing signs of slowing down and the trade tension has not been resolved. In terms of positioning, we would rather be conservative than aggressive at this juncture.